Most provincial laws and programs require that every nursing home resident is provided the care and quality of life sufficient for them to attain and maintain their highest practicable physical, emotional and social well-being. We need to keep in mind that our services will only be achieved by truly making the patient and the resident at the centre of the healthcare system. We need to keep an eye on many aspects that will help residents keep their dignity and self-esteem as they experience a new stage in their life and often a very difficult transition. Keep in mind that some of us are not far behind and will benefit from these recommendations. As we all noticed, healthcare focuses more and more on the resident or the patient. Your patient gowns, bed linens, bath linens will shape the entire resident experience. As most will transition from their home to your facility, it will be the first comparison point and it should be a favorable one. When selecting linens, if the resident is not using his or her own, do not only think about price or about care, think about comfort! Comfortable, soft and warm fabrics make residents more relaxed, even when facing an unfamiliar situation. In general, residents should be encouraged to dress in their own clothes. As much as possible, avoid any reminders that they are in a long-term care facility. If clothing protectors are necessary, select discreet prints or trendy colours. You can also use cloth napkins, if your residents express a preference. Terry or paper clothing protectors are not recommended in that type of setting. In many cases, when residents are confused, whether by early onset of Alzheimer or poor vision, busy prints will add to that feeling of discomfort. If you select linens or curtains with prints, ensure that they breathe and that there is enough space between each repetition. Colours can also have an impact on your resident’s behaviour; selecting soothing colours may have a calming effect on a portion of your population. Also make sure that items that are used daily are of a contrasting colour. It helps residents identify these items more easily1. Nothing is more beneficial to your self-worth then to know and be known. Make sure your residents’ names are known by all members of your staff and that they are addressed with the respect they deserve. As much as possible, minimize the number of different care providers to maintain a high level of recognition. Should you need to label resident’s clothing, always ensure labels are discreet and located strategically to maintain dignity. Keeping your residents safe is always a priority. Keeping track of the various issues is often problematic. Some facilities have put in place, a visual colour-coded system that allows them to immediately assess potential risks in a glance. A piece of clothing, a ribbon, slippers etc. – a colour coded piece of clothing can discreetly help you and your staff identify the patients that could fall or that are confused and may try to leave the facility unsupervised. Similarly, a throw of the same colour on the resident’s bed will add to the efficiency of your program. It is important for your residents and family to know who’s who. It helps them feel secure. If something is needed urgently, it must be clear who is the nurse, the doctor or the cleaning crew. Create a user friendly system and remind your residents regularly. You want to minimize the time they spend looking for the appropriate individual. With a clear system, you will help them feel independent and self-sufficient. Most facilities have a Residents Council where they get to voice their concerns or advocate for change. As generations succeed to each other in our healthcare system, we will have more and more individuals that have opinions and will not be shy about sharing them. Establish other channels that may establish a different dynamic outside the Resident Council and may become an activity to socialize with different individuals. Publish a newsletter where residents can participate. You will benefit by offering a different forum where they can express their values, their preferences and their needs. Social Media is used more and more by the elderly, especially Facebook. Use it to your advantage by creating a page for your facility. In many instances they were the original caregiver. It is important to listen to their grievances and recommendations as it will lead you to provide services that will allow your residents to feel respected and dignified. By involving the families, you will also benefit from positive word of mouth. Your staff cares immensely about your residents. They live by their side almost as much as they do to their own family. They see what may or may not affect the resident’s quality of life. Encourage them to share suggestions and help implement as much as possible. As you keep improving the morale and daily life of your residents, the more beneficial it will also be to you and your staff. A periodic resident survey could help you measure the experiences and perceptions of your resident population. They will feel that their opinion matters and that they are valued. You may choose to do it every quarter, twice or once a year. Family members or a trusted caretaker can help the resident complete the survey. To add to the value of the exercise, you should publicize issues of importance to residents and communicate where you will focus your efforts based on their comments. 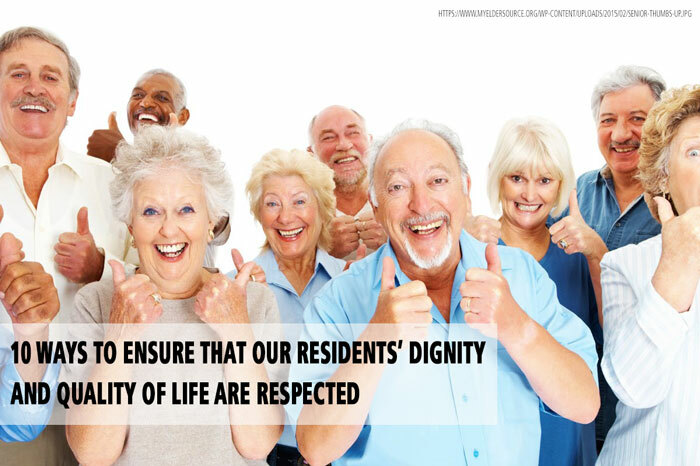 There are many other actions that should be implemented, big and small, and these will come naturally to you as you keep in mind that the resident’s dignity and quality of life is your priority. The LTCCC (Long Term Care Community Coalition) is a great source of information and guidance.